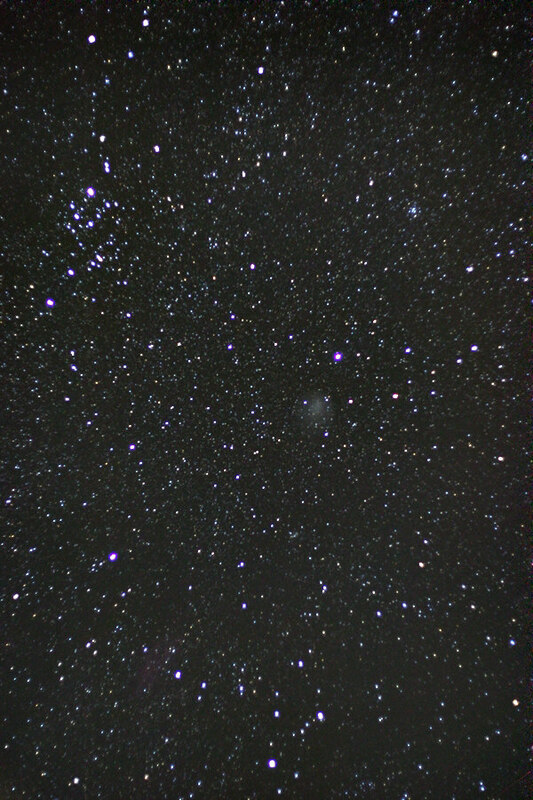 The eastern sky at 6:00 am on Feb 4 (click to enlarge). The February Southern Skywatch is now up. There are various planetary hijinks, an occultation of Antares and a partial Solar eclipse. As well, comet Tuttle and and the energizer of the comet world Holmes, are still visible. February is an exciting month, but you have to be up early in the morning to see most of it. Venus and Jupiter at around 4:30 am on Jan 31. If you are up to getting up before sunrise over the next few days, Venus and Jupiter will be an awesome sight in the predawn twilight. Venus and Jupiter are closest on February 2, but their dance over the next few days will be delightful. Venus will be doing a lot of interesting planetray meetings in the next month, so getting up early will be less of a chore. The Open Laboratory in Nature! The 38th Carnival of Space is now up at Sorting out Science. It is cast as a detective story, and runs the gamut from missing mass to mutant Russian space cockroaches. It's a hoot, so put on your gumshoes and saunter on over. Today the Mars rover Opportunity has been on Mars for 4 Earth years. For something that was meant to have a lifespan of only 90 days that is pretty remarkable. Spirit passed the 4 year anniversary back on January 4. Opportunity is currently trundling around Victoria crater, hopefully the rover team will give us some pictures soon. One of the things keeping me from astronomy and blogging has been family events (and friends dropping over, and we will not mention 3 cornered jacks or disintegrating chain breakers). The eldest two boys have been to The Double Helix Club, programming Lego robots. It's not sophisticated, but the boys figured out how to program the robot to go in a square. The video shows their robot doing just that. Nothing profound, but I am proud of my boys problem solving abilities. The north-east horizon at just before midnight on January 24 (Thursday; click to enlarge) . 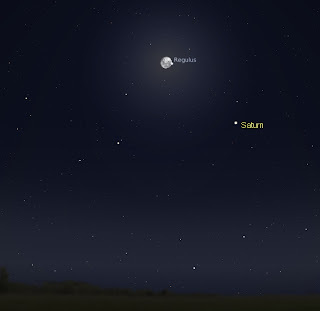 On the late evening of January 24 to the early morning of January 25 the Moon will pass in front of Regulus as seen from Australia and New Zealand. New Zealand sees it at around 4:00 am, most of the east coast Australia sees the occultation around 1 am on the 25th, Adelaide at just past midnight and WA around 9:30 pm on the 24th. For exact contact times for all the major capital cities see this table. or telescopes. The only drawback is the time. Still if you are up late watching TV, pop out and watch this celestial gem. At long last, after much peregrination, perambulation and procrastination, Southern Skywatch's January issue is finally up. You may carp the the Month is almost over, But Comet Tuttle, the occultation of Regulus and a close alignment of Venus and Jupiter. There's lots to see still! I've added links to the books I've been published in, and added woefully overdue links to other blogs (sorry Comet Al, that it has taken so long). Check out the sidebar for the updated links. The Open Laboratory 2007 is here! 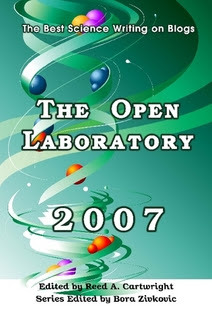 The Open Laboratory 2007 is an anthology of some of the best science blogging produced in 2007. It is now available for purchase as a actual ink on dead trees book and will be available online and in various real bookstores. 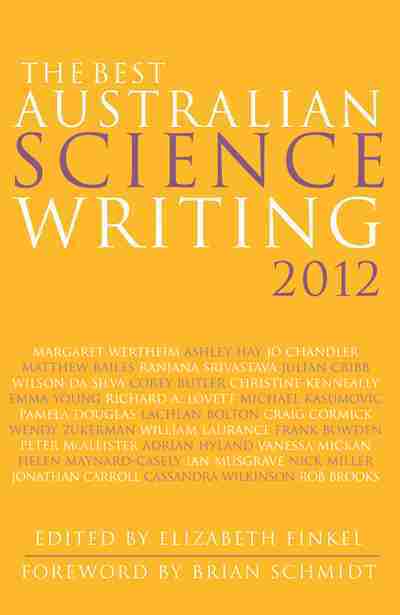 I think it is rather good, but one of my entries is in this anthology so I am biased (I made the Open Lab 2006 as well). You can also read the 53 winning entries here, and my winning entry here and here (I actually had two essays fused together). Why buy the dead tree version when you can read the online versions for free? Well, there is just something nice about holding a real book, and reading online on the beach is well, just not right. As well, it's nice to have all these essays in one handy volume. 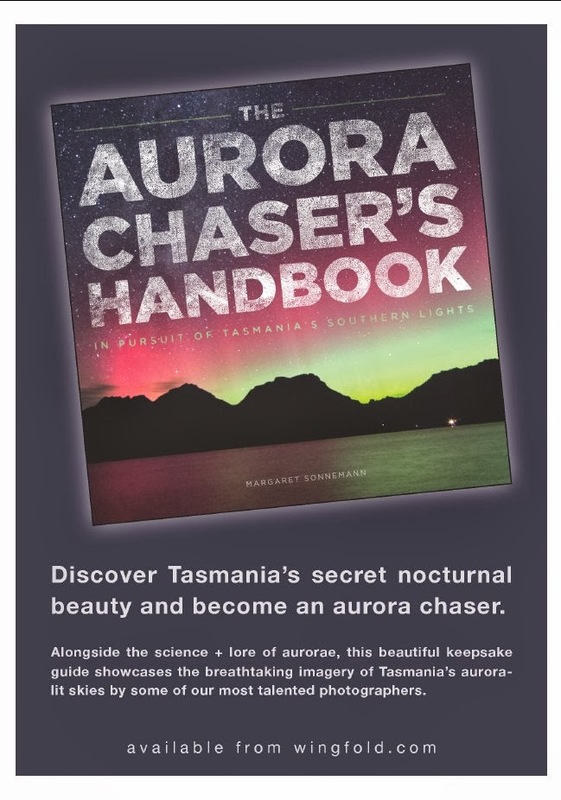 And it supports Science Blogging, proceeds go to supporting the Science Blogging conference, so it is in a good cause. My contributions are all biological, but I will try and get some astronomy in next year. Nova Scorpii: A bright (well magnitude 5.5) unexpected nova, very nice. Gliese 581c & d "Earth-like" extrasolar worlds that may be in their stars habitable zone. Was that exciting or what? The total Lunar eclipse: Just really, really beautiful. Comet 17P: An amazing outburst that just kept on. People can still see it with the unaided eye. Comet 17P Holmes really is the energizer bunny of the comet world. In the northern hemisphere people can still see it with the unaided eye under dark skies, and can pick it up easily with binoculars. 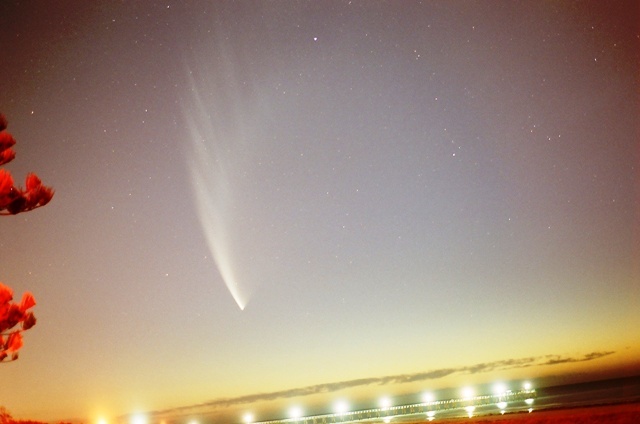 The comet is much higher in the northern sky than it was a while ago, and people in the northern half of Australia with dark skies should see it with binoculars. However, here in Adelaide even the arkly sparkly 10x50 binoculars my beloved family got me for Christmas can't make it out. 17P is currently close to beta Persii (Algol), and should be easy to pick up under dark skies (see the chart for location, it's set for 10:00 pm local time, facing north, for a printable chart, click here). Also in the sky, and much easier to see in binoculars, is 8P Tuttle, it is at the threshold of visibility to the unaided eye under dark skies. Here in suburban Adelaide I picked it up in my shiny new binoculars with no hassle at all. It's sort of a fuzzy blob to me, a bit like a globular cluster. 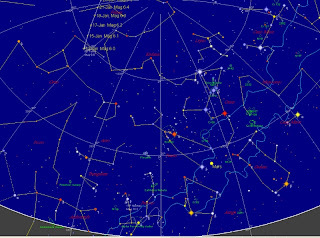 It's almost due west (it looks a bit weird in the chart above as it is centred on north, but it gives you an idea of where it is near the stars. It may be more difficult in the coming days as the comet fades and the Moon waxes, but it's a nice way to start the year with a comet and Mars.